This is so adorable. It took literally seconds to put it together. It is nice to have the goggles and the goggles giving it a more real play experience. 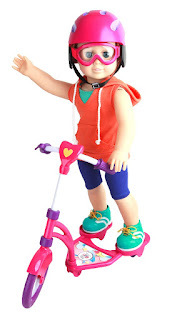 It is great for American Dolls, but if you child doesn't have that doll, any doll around 18 inches will work great. There is so much cute detail and the colors are wonderful. I was very nicely surprised by how durable it was. It comes in a white box and makes it very easy to be giftable. I also liked the stickers a lot, they added a lot to the look of the scooter. I received this product for my honest and unbiased opinion. This scooter gets 5 stars.